Sometimes campgrounds can feel more like a parking lot than a wilderness experience. Fortunately, the United States has millions of acres of public lands available for enjoyment and recreation, and the U.S. Forest Service (U.S.F.S.) supports a policy of dispersed camping, which allows visitors to stay for free outside of designated areas. However, there are a few regulations and guidelines you should keep in mind before you head out to the woods to set up your tent so you don't end up without necessary supplies if without running water and other amenities. If you truly want to find a campsite that's away from it all, consider dispersed camping, but keep in mind that you'll be further away from aide (if you need it) and won't have access to many of the amenities offered by designated camping. The U.S. Forest Service manages 154 national forests and 20 grasslands in 44 states (as well as Puerto Rico) across the United States, and in almost all of these, visitors are welcome to set up their camp outside of designated areas—provided camping is not expressly prohibited. 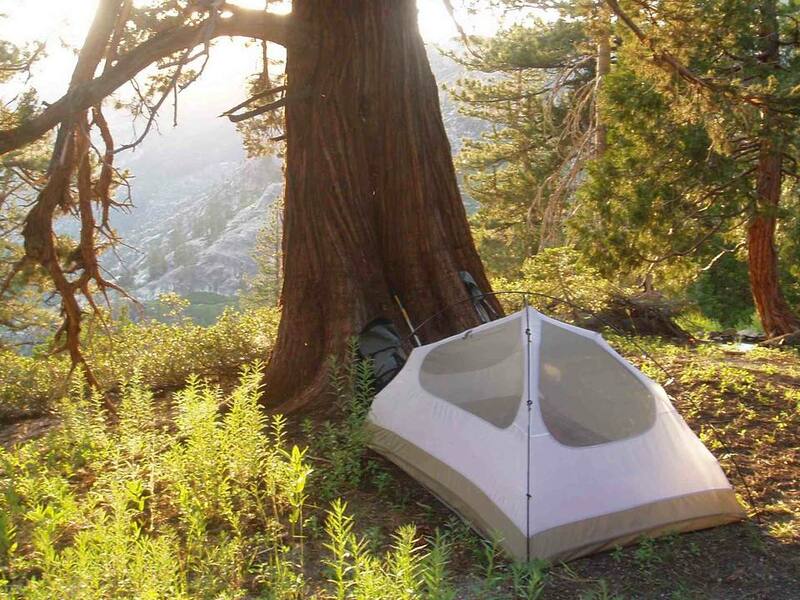 According to the Forest Service, "All National Forest lands are open to camping unless otherwise posted," which provide certain advantages over the designated campgrounds set up in many national forests including "peace, solitude, and adventure." However, the Forest Service also advises that there are a few drawbacks to wilderness camping including fire permit requirements, the need to bring or purify water, the possibility of floods, and having to properly dispose of human waste while in the forest. Leave No Trace: The Forest Service asks that guests respect the forests and help keep them clean for all to enjoy by packing out any trash brought in—with the exception of human waste. Fireworks and Firearms: Rules stipulate that both can only be used in accordance with the U.S.F.S. rules. Fires: Campfires must be completely extinguished before leaving it, and failing to maintain control of your campfire is strictly prohibited. Be sure to have a bucket or vessel for water nearby in case it gets out of hand; remove all flammable material from around the campfire to prevent its escape. Firewood: Dead and down material may be used for fires; living trees, shrubs, and plants may not be cut or damaged. Burn Bans: Fires may be prohibited during burn ban conditions; obey any special restrictions that have been issued or posted, and be sure to check the website for the National Forest you plan to visit before lighting your campfire. Food Storage: Check bulletin boards for more information on local regulations regarding storage of food, which may be in effect in some areas. Proper food storage is required to prevent wild animals and campers from harm. Roads and Trails: National Forest Service roads and trails are closed to motorized vehicle use when blocked by a gate, sign, earthen mound, or physical barrier erected to restrict motorized vehicular travel. Fees: There are no fees for dispersed camping. However, some areas may charge for parking. Human Waste: Since there are no toilet facilities, human waste must be buried in a hole dug at least six inches deep. Flooding: While not common across America's National Forests, flooding may occur during the spring due to heavy rainfall or large amounts of snow melting. As a result, you should not camp within 100 feet of any water sources. Clean Water: To avoid illness, all natural water should be purified before consuming, and you should be sure to bring plenty of water if you're using dispersed camping as there is no running water outside of designated camping areas and facilities. If you can avoid breaking any of these rules of dispersed camping, you're well on your way to a quiet escape from all the noise of civilization in a national forest.